Leading Manufacturer and Exporter from Delhi, our product range includes Handheld Particle Counters such as Handheld 6 Channel Particle Counter and Handheld 3 Channel Particle Counter. 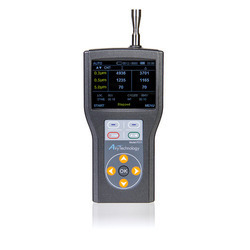 With the help of adroit professionals, we are proficient to present a superior range of Handheld 6 Channel Particle Counter, which is known for excellent performance and longer operational life. Adroit engineers use the optimum quality component and advanced technology to develop these products as per industry norms. These products are enormously employed in the market due to their features. 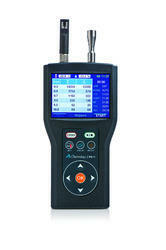 We offer a comprehensive range of Handheld 3 Channel Particle Counter. This product is made employing the optimum quality material and sophisticated technology, secured from trustworthy sellers of industry. Our products are enormously admired owing to top performance and longer operational life. We are providing this product to patrons at low prices. 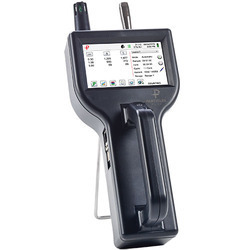 The Particles Plus 8303 Handheld Particle Counter measures 0.3 μm to 25.0 μm with a flow rate of 0.1 CFM (2.83 LPM). Easy to configure, this instrument displays up to 3 user-selectable size channels as well as (optional) temperature and relative humidity. View data and generate ISO 14644-1, EU GMP Annex 1 or FS 209E reports. Export to Particles Plus data-software. The 8303 also has a mass concentration mode that approximates density in μg/m³. The Particles Plus 8306 Handheld Particle Counter measures 0.3 μm to 25.0 μm with a flow rate of 0.1 CFM (2.83 LPM). Easy to configure, this instrument displays up to 6 user-selectable size channels as well as temperature and relative humidity. View data and generate ISO 14644-1, EU GMP Annex 1 or FS 209E reports on screen or via printer, USB key, real time through its versatile output options or export to Particles Plus data-download software. Particles Plus counters can be controlled and monitored remotely via web browser. The 8306 has a mass concentration mode that approximates density in μg/m³.